11th lunar month of 1806: he becomes disciple of the star Segawa Senjo and takes the name of Segawa Tamon I at the Nakamuraza. 4th lunar month of 1809: premiere at the Nakamuraza of the 7-role Nagauta-based dance-drama "Kantan Sono no Kikuchô"; Tamon plays the role of a kamuro [more details]. 12th lunar month of 1810: his master Segawa Senjo dies. 11th lunar month of 1812: his future father-in-law Segawa Rokô IV dies. 11th lunar month of 1815: he becomes tateonnagata and takes the name of Segawa Kikunojô V at the Kawarasakiza, playing in the drama "Yamato Meisho Senbon Zakura". 3rd lunar month of 1817: premiere at the Kawarasakiza of Tsuruya Nanboku IV's masterpiece "Sakura Hime Azuma Bunshô"; Kikunojô plays the roles of Gunjibei's daughter Kohina and Katsushika no Ojû [casting]. 2nd lunar month of 1818: the play "Kamakura Sandaiki" is staged for the first time in Edo, at the Nakamuraza; Kikunojô plays the role of Princess Toki; his stage partners are Ichikawa Danjûrô VII (Miuranosuke) and Nakamura Shikan I (Takatsuna). 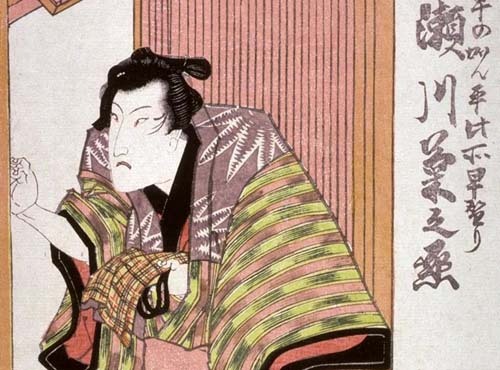 6th lunar month of 1818: Kikunojô plays at the Moritaza the roles of Koganosuke, Sadaka and Omiwa in the drama "Imoseyama Onna Teikin"; his stage partners are Ichikawa Danjûrô VII (Motome, Fukashichi, Hinadori, Daihanji) and Matsumoto Kôshirô V (Soga no Iruka). 1st lunar month of 1823: Kikunojô's rank in the Edo hyôbanki, wakaonnagata section, is jô-jô-kichi (superior - superior - excellent). 3rd lunar month of 1823: premiere at the Ichimuraza of Tsuruya Nanboku IV's drama "Ukiyogara Hiyoku no Inazuma"; Kikunojô plays the roles of the courtesan Katsuragi, Oden and Okuni [casting]. 11th lunar month of 1823: Kikunojô achieves a great success at the Nakamuraza, performing in the drama "Kaeri Giso Kiku no Hitomure". 8th lunar month of 1826: Kikunojô plays at the Kawarasakiza the roles of Momonoi Wakasanosuke, Hayano Kanpei and Okaru in the drama "Kanadehon Chûshingura". The roles of Kanpei and Okaru are performed with fast costum changes (hayagawari), an unusual performance in "Kanadehon Chûshingura" sixth act, where Kanpei and Okaru usually appear simultaneously on stage. 9th lunar month of 1827: Kikunojô plays at the Nakamuraza the difficult role of Kuzu-no-Ha in the drama "Ashiya Dôman Ôuchi Kagami". 1st lunar month of 1828: Kikunojô's rank in the Edo hyôbanki, sôkanjiku section ("all kanjiku"), is hakudai-jô-jô-kichi (almost grand - superior - superior - excellent). Revival at the Nakamuraza of the dance-drama "Oshidori" by Segawa Jokô II; Kikunojô plays the roles of the keisei Kisegawa and the spirit of the female mandarin duck [more details]. 9th lunar month of 1828: premiere at the Nakamuraza of the drama "Nochi no Tsuki Shuen no Shimadai" (commonly called "Kakuemon"). The main roles are played by Nakamura Shikan II and Kikunojô. 11th lunar month of 1828: his yearly salary at the Nakamuraza reaches 700 ryô. 9th lunar month of 1829: premiere at the Kawarasakiza of the 4-role hengemono "Hana ni Chô Magaki no Ukareme"; all the roles are performed by Kikunojô; the 2nd role, the komori, is still part of the current Kabuki repertoire and is performed independently under the title "Mitsumen Komori" [more details]. 11th lunar month of 1829: premiere at the Nakamuraza of Tsuruya Nanboku IV's drama "Kin no Zai Sarushima Dairi"; Kikunojô plays the roles of Sôma Masakado (in reality Mitsunaka's daughter Princess Takiyasha), the female thieve Ikazuchi-ga-Hora no Todoroki, Manago no Shôji's daughter Princess Kiyo and the shirabyôshi Sakurako [more details]. 1st lunar month of 1830: Kikunojô's rank in the Edo hyôbanki, wakaonnagata section, is dai-jô-jô-kichi (grand - superior - superior - excellent). 8th lunar month of 1830: Kikunojô plays at the Nakamuraza the roles of Hinadori and Omiwa in the drama "Imoseyama Onna Teikin"; his stage partners are Nakamura Shikan II (Daihanji, Motome, Fukashichi) and Nakamura Karoku I (Sadaka, Princess Tachibana). 11th lunar month of 1831: Kikunojô appears on stage for the last time, at the Kawarasakiza, playing in the drama "Matsu o Chikara Tomoe no Fujinami". He unfortunately falls ill during the performance and has to be replaced by his disciple Segawa Michinosuke II. He dies in the 1st lunar month of 1832. Segawa Kikunojô V was a talented onnagata of the Bunka and Bunsei eras, who was endowed with both beauty and intelligence. He unfortunately died too young.